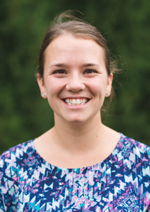 Abbie Masserant first came to Meadow in 2006 as an assistant in The Nest and The Toddler Room. In 2011, she graduated with a bachelor’s degree in Elementary Education from The University of Toledo. For 5 years, she taught a 3 and 4 year old class at a private school. Abbie has returned to Meadow as the head teacher in Children’s House East. She is currently completing her Montessori training from Adrian Dominican Montessori Teacher Education Institute. Abbie lives in Monroe with her husband, Shane, and daughter, Marlee. She is very excited to have her own child attending Meadow with her! Abbie enjoys reading, tea, shopping, traveling, and spending time with her family. Abbie can be reached at amasserant@meadowmontessori.org.